Readers of my books Fingerprints of the Gods (first published April 1995) and Heaven’s Mirror (first published September 1998) will know that I have consistently argued that the Americas were inhabited in prehistoric times by a variety of different ethnic groups – Negroid, Caucasoid and Mongoloid. 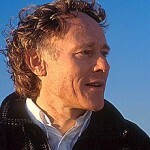 Such ideas have caused deep offence to some American Indians, who have long claimed to be the only ‘native’ Americans, and also contradict academic teachings which hold that the New World remained uninhabited by humans until the end of the last Ice Age and was then settled exclusively by Mongoloid nomads from Asia who crossed the Bering Straits about 12,000 years ago (when there was a land bridge between Siberia and Alaska) and made their way thence into all of North and South America – reaching the latter only about 9000 years ago. Naturally this teaching also holds that no Caucasoids or Negroids were present anywhere in the Americas prior to the coming of Columbus and the European conquest in the fifteenth and sixteenth centuries AD. One of the historical mysteries that drew me into writing Fingerprints was the eloquent mythical and sculptural testimony concerning a time, long ago, when people who were definitely not American Indians inhabited the Americas. 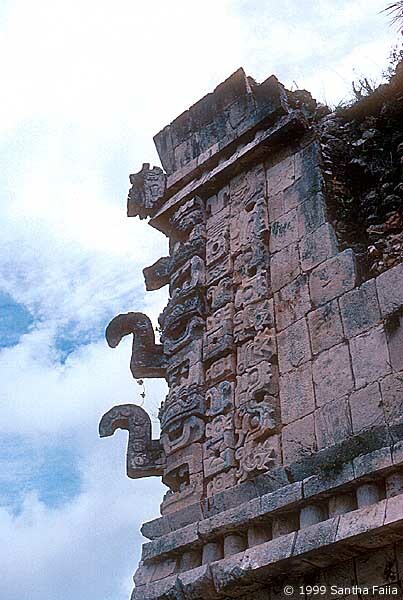 Both the god Viracocha, in South America, and the god Quetzalcoatl in Mexico were described as tall, white-skinned and red-bearded – sometimes blue-eyed as well. At Monte Alban, near Oaxaca, and at La Venta, on the Gulf of Mexico (a site associated with the mysterious "Olmec" culture, supposedly the first and the oldest high civilisation of Mesoamerica), ancient carved figures have been found that seem to depict such individuals. 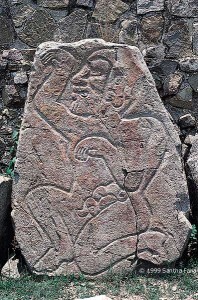 In the case of Monte Alban these Caucasoid figures date back to about 600 BC and in the case of La Venta to about 1200 BC – almost 3000 years before the European conquest. 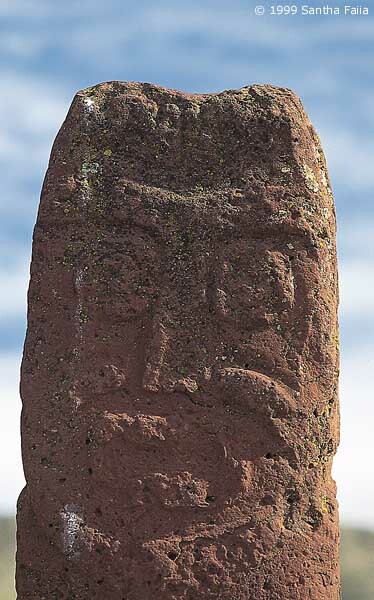 More intriguing still, other sculptures, mostly in the form of carved megalithic heads, were also found at La Venta in the same archaeological strata as the Caucasoid figures. 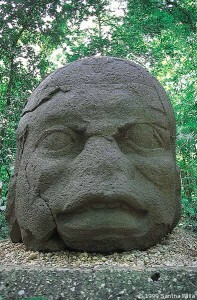 Once again, these sculptures, the so-called "Olmec Heads", do not display the typical features of native American Indians. This time they are unmistakably Negroid in appearance – depicting individuals who must have closely resembled modern Africans, Melanesians or Australian Aborigines. Washington Post, Final Edition, Tuesday 15 April 1997. Not all scholars agree that Kennewick Man was a Caucasoid [Link 1]. But at the very least the discovery has raised significant doubts about the established model of the peopling of the Americas. Other discoveries have raised further doubts. "Similarities to modern day Aborigines or Africans…"
‘It was the head of an old man with a broad flat nose and thick lips. The lips were slightly parted, exposing strong, square teeth. The expression on the face suggested an ancient, patient wisdom, and the eyes seemed to gaze unafraid into eternity… It would be impossible, I thought, for a sculptor to invent all the different combined characteristics of an authentic racial type. The portrayal of an authentic combination of racial characteristics therefore implied strongly that a human model had been used. 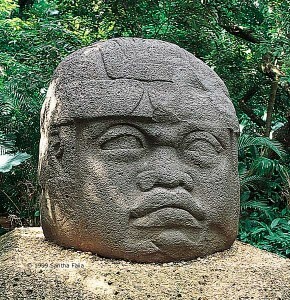 Up till now, as far as I know, no scholar has pointed out that the discoveries in Brazil and Columbia could offer an explanation for the Negroid features of the Olmec Heads. 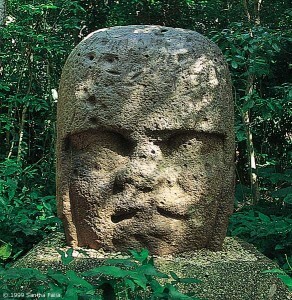 It’s true that the Olmec sculptures were found in strata between 3000 and 4000 years old – whereas the Brazilian and Columbian skeletons are much older than that. But this does not rule out a possible connection. 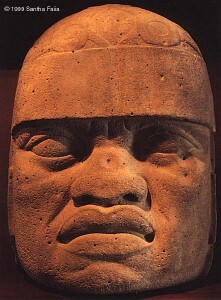 At the very least it is surely an intriguing coincidence (a) that pieces of monumental sculpture depicting Negroid individuals have come down to us from the prehistoric antiquity of the Americas and (b) that a Negroid people, previously unidentified and unsuspected by historians, have now been scientifically proven to have inhabited the Americas around 12,000 years ago. Perhaps the "Olmec" Heads were not made by the "Olmecs" at all but were inherited by them as heirlooms, handed down from an earlier time? 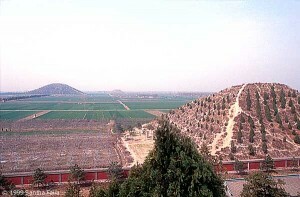 A footnote to this story, and a sign of the galloping collapse of consensus amongst orthodox scholars concerning the peopling of the Americas, is a row that began to simmer in academic circles in the late 1990’s concerning possible cultural links between ancient Chinese and ancient American cultures – specifically the Olmec and the Shang. The main proponents of this view are Professor Mike Xu, who teaches in the foreign languages department at the University of Central Oklahoma, USA, and Chen Hanping of China’s Historical Research Institute. 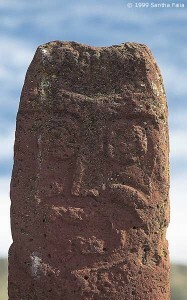 ‘Some asked me to post my observations re the script on the Olmec celts identified by Chen, Hanping as Chinese in US News and World Report Nov 4, pp 46-8. 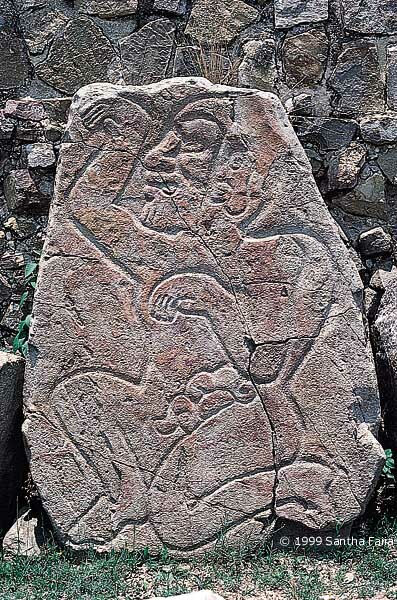 I have finally seen the article with the reproduction of the Olmec graphs and the section that Chen believed was similar to the oracle bone script of the Shang. the graphs isolated by Chen are not Chinese. They bear some graphic similarity to some archaic Chinese graphs or parts of graphs but as single graphs equal nothing and do not have the equivalents he assigned to them. It is bogus. obviously, the graphs/glyphs pulled out by Chen should be considered within the context of the entire "inscription". This is impossible as the rest of the marks bear none but a few isolated similarities. 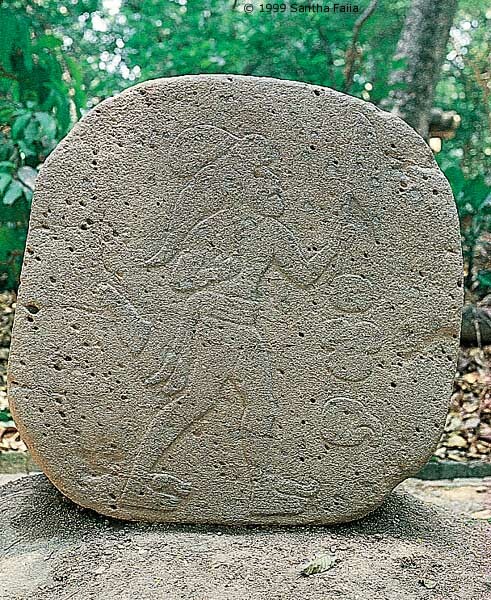 In fact the Olmec "script" may not represent language at all, but like the Naxi and other ur-scripts, be more a code for storytelling than an actual transcription of language. The Shang oracle bone script, on the other hand, is very advanced and unquestionably qualifies as belonging to a writing system. 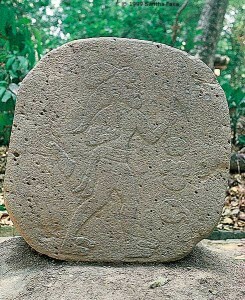 Finally, the "inscription" must be considered within the context of the sculptures. There is very little beyond the occasional face of human representation in Shang period art (some carved jade figures, but these are kneeling, often incised, and covered with animal décor, tattoos, clothes, etc.). 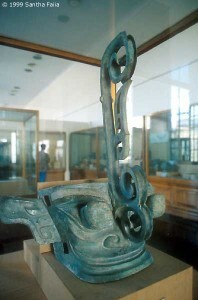 One famous bronze has a shaman-like figure in the mouth of an animal, but there is no similarity to the Olmec representations. I haven’t the faintest idea whether Professor Cook and the other critics are right or whether Xu and Chen are onto something with their Shang-Olmec connection. Further open-minded research is required to settle the issue but in the meantime I would like to draw attention to a small piece of evidence that Santha and I first became aware of when we visited the Mysteries of Ancient China Exhibition at the British Museum in early January 1997 and, more recently, when we visited Beijing’s History Museum in March 1999. 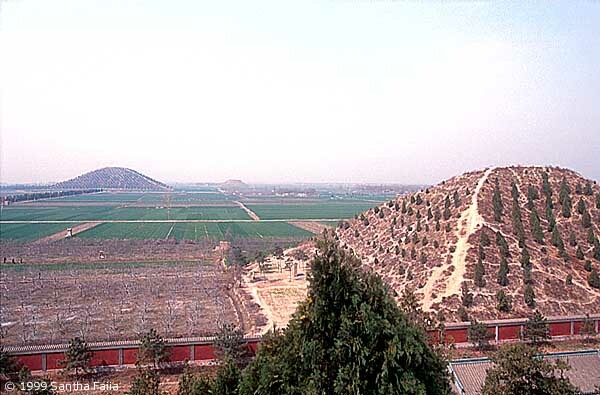 We were intrigued by artefacts from the sacrificial pits at Sanxingdui in Sichuan province. Including bronzes in the shape of human heads, fragments of gold, many jades and a large number of elephant tusks, these artefacts were discovered in 1986 and are the work of a previously unidentified high civilisation that flourished in Sichuan from around 1200 to 1000 BC. Is it a coincidence that almost exactly the same ‘fantastic’ and ‘startling’ features – bulging eyes and a long, curling projection to the nose – are found upon the Chac masks of the ancient Maya of Central America, the successors to the Olmecs? Chac masks were sometimes also incorporated as architectural features into Maya temples. Perhaps such similarities are just coincidences – although personally I rather doubt it. Setting aside all other issues and anomalies, however (and there are many, eg, see images on right), I contend that the ancient Caucasoid and Negroid skeletons that have been found in the New World mean that there can no longer be any room for preconceived notions. The true history of the peopling of the Americas is likely to turn out to be extraordinarily complex and attenuated, involving many different ethnic groups and cultures in many different epochs. 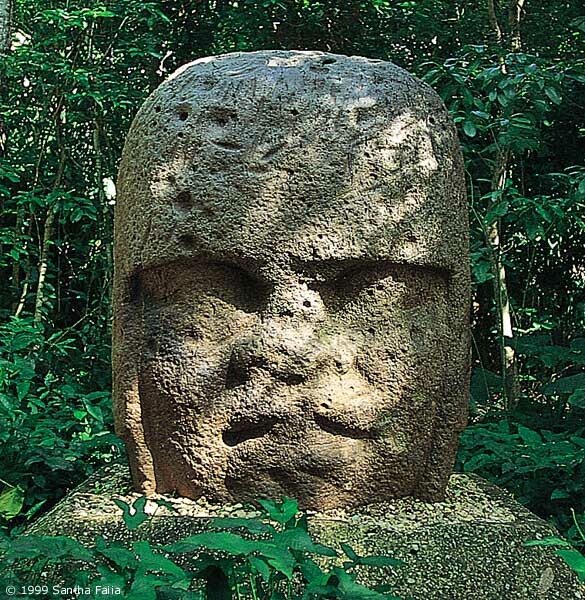 It does not surprise me at all that the Chinese might have been here 3000 years ago, or the Phoenicians at about the same time – as others have suggested – or the remarkable Jomon culture of Japan, or the Egyptians, or – much later – the Vikings. I believe it to be very likely, indeed little short of a certainty, that all these peoples and several others as well must have independently ‘discovered’ the Americas, in isolated individual cases, over and over again, from the very earliest times. If we keep on pushing this inquiry back into the past – back beyond the earliest-known historical civilisations – then what, ultimately, do we come to? 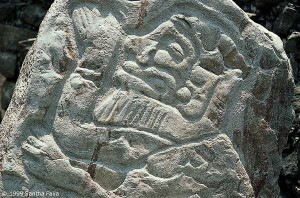 The possible Shang influence on Olmec writing and art takes us back 3000 years, well within the bounds of recorded history. But Kennewick Man and Luzia take us back respectively 9300 and 12000 years, the latter date being some 7000 years earlier than Sumer and Egypt – the earliest known historical civilisations – and smack in the middle of the end of the last Ice Age when the Earth passed through a gigantic cataclysm and floods from the melting ice sheets scoured the globe. Some scholars have expressed the view that Luzia’s people could have come to South America from the Pacific and been related to Australian Aborigines. Certainly there is evidence that in ancient times the Aboriginies possessed sophisticated sailing and navigational skills. 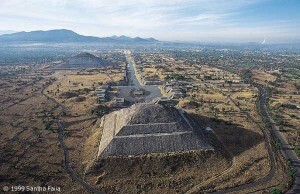 So far, however, there is no historical theory that can explain the presence in the New World at such early dates not only of Negroid Aboriginies but also of Caucasoids – let alone the fact that memories of these conspicuous strangers appear to have been preserved in myths and in sculptures as far afield as Bolivia and Mexico. As well as being an intriguing human and archaeological mystery, therefore, what we now know about the first Americans represents a radical and robust challenge to orthodox scholarship. I suspect that this story will run and run.